‘Tis the season to be jolly! And stressed! And broke! And also, the season to sort of regress to your seven year old self at family gatherings! Fa la la la la-la la la la! Just in case you need a little fortifying of your parenting principles, here are some things to consider. Ten ideas to help you advocate for your children and give them room to grow in dignity and rights this festive season. In all the chaos of big family gatherings and the end of year rush, our children can get somewhat left behind. I mean this emotionally – although, I for one, actually did loose a child at the Christmas Lights show last year. If you don’t already have certain connecting rituals throughout your day, a sort of tap-in and fill-up point for your child’s emotional cup, now is the time to do it. Gordon Neufield and Gabor Maté have this beautiful idea of “collecting” our children. At certain points in the day, after waking, when they return from an outing, after they’ve been deeply involved in an activity, parents are to stop everything and connect – show interest in what’s been going on for them since the last collection, lots of eye contact, or cuddles. The aim is to give our children the sense of us being there for them, a secure cave of safety to which they can return. Over this busy time trying this collecting ritual and see if it helps you and your child retain your emotional equilibrium. Is it time for you to consider the Santa myth in your family? I don’t have a dog in the fight/ reindeer in the sleigh for this one; I’m not out to tell you that your Santa myth is absolutely stopping you be an ally to your children. But I do want to gently probe: when does the adamant continuation of a fairytale become an outright lie? If your child asks you for the truth, will you give it to them? Parents are the source of information and the first trusting relationship they will have in their life, how much are you willing to compromise that in order to keep up the Santa myth? You can still do Santa, you can still have the magical fairytale in your life, just keep it as one of the many make-believe stories in your children’s life. We can’t predict what presents are going to spark our children’s heart. And it is also true that none of them may. They may be so overwhelmed by the whole day and the whole expectation of the gifts, that they can’t rise to the occasion with effusive gratitude. Please be assured this is quite normal. Before you head into the gift-giving season, check in with your motives. Give with joy and love, without any expectation of getting something back. If you are in a big gathering where gifts are being given, sit with your child and model gratitude as they open their gifts, say “thank you!” to Aunty Gladys when your child opens the toy tractor. And catch up with people after, don’t feel you have to apologise if your child didn’t show heaps of gratitude, but do let them know of your own gratitude for the gifts they gave your child. Also, do a $2 candy cane trail. 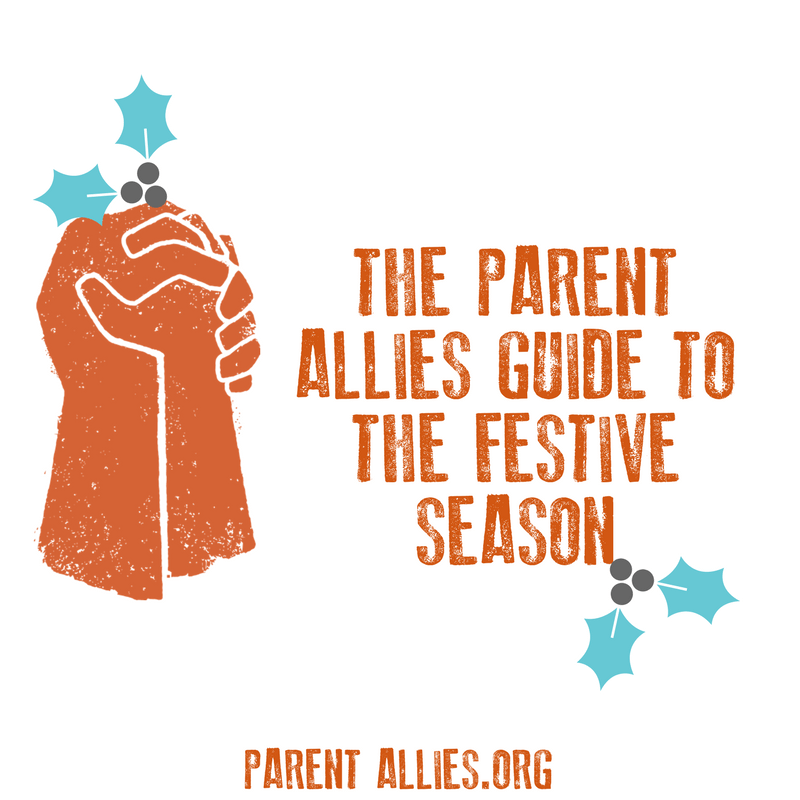 Big gatherings or parties can be quite intense for children, especially for children already dealing with anxiety – read more specifically on being an ally to your child with anxiety. They can also, potentially, be unsafe places. Check in with your kids. Ask if they feel safe. Comfortable? If there are strangers or family members you feel uncomfortable about, follow your intuition and tell your children to go with their gut feelings too. Make sure they know to come to you if they feel unsafe or uncomfortable. Our children can be wise and discerning beyond measure. Feel free before heading to someone’s fancy house with fancy furniture, to have a conversation with your child. Let them know that in this house people only really sit on the sofa, rather than climb it. Let them know that they can talk to you if they are finding this hard, that you’ll help them find a place they can climb and let all their energy out. Let them know some of the expectations of this group of family – staying at the table, say, or not really liking poo jokes, or whatever. All we can do is let our children know of the different expectations, and make it easier for them to meet them, without crushing their spirit or the essence of who they are! Ultimately I believe that we should let children blossom and be exactly who they are, true to their urges and passions but on occasion, it can be alright to let your kids go in with eyes wide open about how things are done differently in this home. They might be able to handle it you know, and if not…. You are your child’s advocate. If they are unable to meet a litany of unrealistic expectations, it is not their fault! It’s unfair to let the (often arbitrary) whims of adults dictate behaviour, communication, even the whole mood of the day. There are so many areas of our children’s lives that we manage to imbue with shame. Have one or two scripted lines tucked under your belt that you’ll feel comfortable pulling out if someone has a commentary about your child’s developmentally appropriate behaviour. Have a play with some sentences on the issues that you think might be most confronting for your family. And let’s hope you don’t have to use them! Big family gatherings can be rife with overstepped boundaries, particularly a child’s bodily autonomy. There are Great Aunts pressing for kisses, big cousins not heeding the word STOP when tickling their younger ones. Bodily autonomy is a RIGHT and yet children have theirs flouted near constantly. A sense of respected bodily autonomy is so important for children, both for their growing self (see these tables about what is important of children as they grow) but also to keep them safe from predators. 1 in 3 girls and 1 in 6 boys here in NZ will be sexually abused by the age of 16. Part of the solution for this horrendous statistic is helping the child understand that they are the boss of their body, and also building a culture of consent from birth. Above all, figure out what is most important to you over this festive period. Is it staying true to your parenting principles? Is it being kind and compassionate? Is it changing the culture of childhood? And then, find a hook to hang it on. Wear a ring that reminds you of your mantra, change your phone screen, draw a love heart on your wrist each morning. Something that you’ll see throughout the day that will give you a little jolt, reminding you of your higher purpose. I believe it’s often possible to brave and kind. We can confront the oppression of our children with love in our hearts. But it’s not always possible to come out of it seeming like a “nice person.” My hope for you, for all of us, this festive season is that we can remain true to our call to be allies to our children. That we can show empathy to everyone, but not at the cost of our child’s dignity. Let’s advocate for our children with kind intent and a core of steel.